Coakley Attack Ad Misspells "Massachusetts"
This post is from CBS Station WBZ in Boston. Martha Coakley's first attack ad in the special election to fill Ted Kennedy's Senate seat had an embarrassing mistake in it. Massachusetts was misspelled at the end. 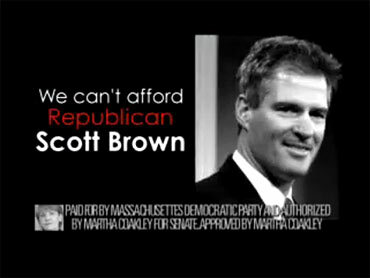 "Paid for by Massachusettes Democratic Party…" the text read at the bottom of the commercial's final seconds. When asked about it Tuesday, Coakley said she was not aware of it. The mistake was corrected for future airings. Could Scott Brown Defeat Martha Coakley in Massachusetts Senate Battle?